The Wiradyuri people were known as the people of the three rivers: the Wambool (now known as the Macquarie River); the Kalari (the Lachlan River, from which the electorate takes its name); and the Murrumbidjeri (the Murrumbidgee River). 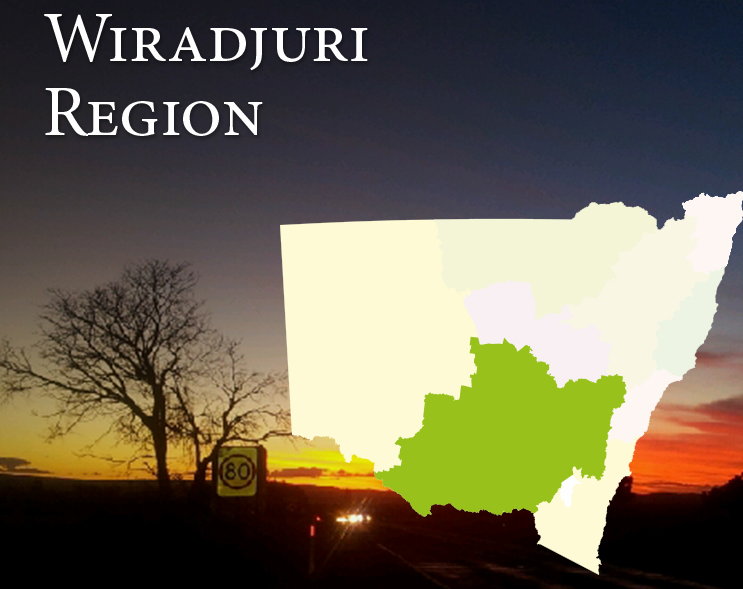 Wiradyuri country is the largest in NSW, stretching from the eastern boundary of the Great Dividing Range. Drawing a line from the present towns of Hay and Nyngan approximates the western boundary. While Gunnedah and Albury mark the northern and southern boundaries of Wiradyuri country. 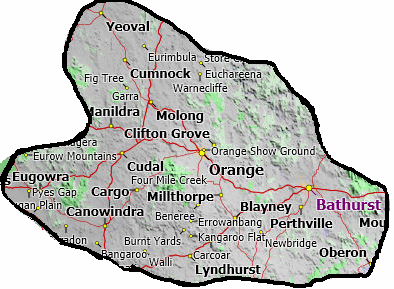 The Bathurst Regional Council area is located in the Central Tablelands of New South Wales, about 200 kilometres west of Sydney. Bathurst is Australia’s oldest inland settlement and has many fine historic buildings and is one of Australia fastest growing regional centres. The largest single industry is education, followed by fruit and vegetable production, a vegetable cannery, a fish processing plant, a pet food processing plant, government departments and community services. The Bathurst Regional Council area Community Profile provides demographic analysis for the City and its suburbs based on results from the 2011, 2006, 2001, 1996 and 1991 Censuses of Population and Housing. The median rent in Bathurst Regional Council local government area is $170.00 compared to $190.00 in Australia. The Orange City Council known as Australia’s Colour City, is just 256 kilometres from Sydney and within easy reach of the Blue Mountains. When you visit the Orange Region you will discover a welcoming city, rich in local history, a flourishing cultural scene, fruitful landscapes, historical buildings, art and culture to surprise you and some of the best food and wine in Australia. The Census population of Orange City in 2014 was 40,108, living in 16,010 dwellings with an average household size of 2.49. Young people experiencing homelessness face a hard time finding somewhere safe and secure to live. It is more difficult for them to maintain support, connect with their community and participate in education, training and employment. Young people who experience homelessness are at increased risk of experiencing ongoing homelessness as adults and there are more young women who are homeless than young men. Family breakdown and domestic and family violence are two of the primary reasons young women seek support from homeless assistance services. Family breakdown is also one of the primary reasons young men report for seeking support from services. For some young people fleeing physical, sexual and emotional abuse, reconciliation with their families may not be possible. With adequate support and resources reconciliation may be possible for some young people and their families. Young people also have difficulty securing long-term accommodation and are particularly affected by poverty and the shortage of affordable housing in Australia. The level of Youth Allowance payments makes it difficult for independent young people to meet the basic costs of living. Young people face a long wait for public housing and often experience discrimination in the private rental market. The complex interrelationship between mental illness and homelessness has long been noted by service delivery agencies, public health workers and social justice bodies. Following changes in mental health service delivery in the latter part of last century, the observation was swiftly made that the homeless reflected higher rates of mental illness than the rest of the population. The concepts of home and homelessness may cross different communities in Australia. Homelessness in Aboriginal and Torres Strait Islander communities cannot be understood without reference to the legacy of colonisation and dispossession. A history of physical and cultural displacement leaves many indigenous people at increased risk of homelessness. Concepts of country are fundamental to the culture and identity as being homeless is they have a spiritual connection to the land they live on irrespective of the type of shelter they live in. Some indigenous Australians may experience separation from their traditional land, family or kinship groups as spiritual homelessness. 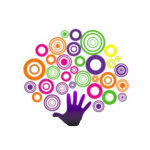 Some people who are homeless are from CALD (culturally and linguistically diverse) backgrounds. This creates additional barriers to accessing emergency accommodation, long term housing and other support to resolve homelessness. Refugees and asylum seekers face further complications related to legal and language barriers that make it difficult to work and to use social services, increasing their vulnerability to homelessness. With few specialist providers of culturally diverse support models in an over-stretched homeless service system, the homelessness of people from this group often remains hidden. People from CALD backgrounds are just as likely to suffer the poverty, ill health and violence that are amongst the causes of homelessness. However they may be unaware of the support services that are available. Due to funding restrictions homelessness services are not always able to provide culturally appropriate support such as translation services and bi-lingual staff. Homelessness is often perceived to be a metropolitan problem. In actual fact a significant proportion of people experiencing homelessness are in regional, rural and remote Australia where there are fewer services available to assist them to resolve the issues leading to their homelessness. This is especially the case in outlying and remote areas. The risk of homelessness in rural and remote areas is extremely high due to a greater likelihood of low incomes, high living costs and poor housing relative to regional and metropolitan centres. The limited availability of services means that people’s choices and ability to find pathways out of homelessness are greatly reduced.